GRAM on the Green, Tuesday Evening Music Club, Jazz in the Park and Celadon Summer Concert Series offer free, outdoor summer concerts throughout the summer. With summer in full swing and Grand Rapids buzzing with live music, the events and activities can start to build up and empty wallets. Four organizations in Grand Rapids have made it possible for the public to enjoy outdoor music events without breaking the bank. GRAM on the Green, Tuesday Evening Music Club, Jazz in the Park and Celadon Summer Concert Series offer free, outdoor musical events throughout the summer, giving the Grand Rapids area entertainment they don't have to pay for and simultaneously building community. GRAM on the Green is back for the 7th annual year, to bring local and regional music to the heart of Grand Rapids. The free outdoor concert series is hosted by the Grand Rapids Art Museum (GRAM). In the spirit of keeping things free, admission to the GRAM will also be free to the public throughout each event. “There’s always a lot of stuff to do all summer, but a lot of stuff costs money and it's great to have something free that you can do with friends and family,” says Cia Segerlind, Public Relations Coordinator for the GRAM. There will be six different concerts throughout July and August. The first event of the summer series will be indie rock/soul group, Vox Vidorra on July 9. “The lineup this year is really strong and diverse. I’ve booked an eclectic mix of music, so we have different crowds each concert,” says Music Director Ed Clifford. Along with listening to the live performances, guests will be able to participate in activities on the Wege Plaza as well as have access to a cash bar and various food trucks. Segerlind says bringing people downtown as well as introducing them to the art museum are some of the benefits of having a free concert series. 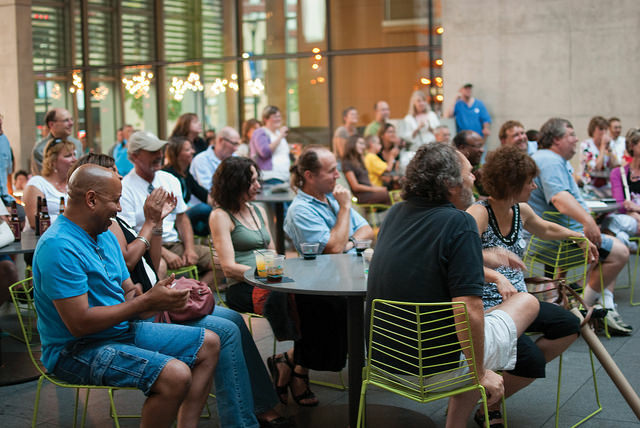 Tuesday Evening Music Club at the Frederik Meijer Gardens Amphitheater stage runs Tuesday evenings from July 7 until August 25. Admission is free to Meijer Gardens members and included with the price of admission to non-members.The lineup consists of local and regional artists. During the event, all of the gardens is open to concert-goers until 9 p.m. Guests are welcomed and encouraged to bring food during shows, but the Tastes of The Gardens Cafe will be open as well. The concert series, which was founded in 2003, will kick off the summer on July 7 at 7 p.m. with Global Roots, an event that represents various cultures and relates to the Meijer Gardens’ 20th anniversary theme, Welcoming the World. “Its kind of a fun atmosphere,” says Andrea Wolschleger, Public Relations Manager for the Gardens. “It’s just a nice relaxing evening. You can bring in food and sealed liquids.&rdquo. Wolschleger says a smaller venue makes Tuesday Evening Music Club a different atmosphere than other bigger concerts. Jazz in the Park, presented by the West Michigan Jazz Society (WMJS), will host 10 free events throughout the summer. Formerly Jazz at the Zoo, Jazz in the Park is returning for the 15th year, but in a new location at Ah-Nab-Awen Park ( 220 Front Ave NW). The jazz concert series is free thanks to support from the City of Grand Rapids as well as individual sponsors. WMJS members get free parking in the Ellis Parking Lot off Scribner. The series already kicked off the summer with two events. The next concert will be the Steve Hilger Jazz Quintet on June 22. Celadon Summer Concert Series is an all ages free backyard style concert located in the Celadon Amphitheater within the Celadon New Town community (2050 Celadon Dr.). “It’s very unique. I’ve never seen a community that has its own amphitheater,” says Ryan Braman, co owner of Little Duck Music and promoter for the Celadon Summer Concert Series. The June 25 concert begins at 6:30 p.m. and features Jim Shaneberger Band and Fly Paper. Braman says the concert series is mostly based on word of mouth and there hasn’t been a significant amount of promoting thus far. Part of the reason being the small seating capacity of the amphitheater. But Braman says that’s part of the draw: it creates an place where guests can relax and enjoy the backyard atmosphere. Braman says the Celadon Summer Concert Series brings people together.